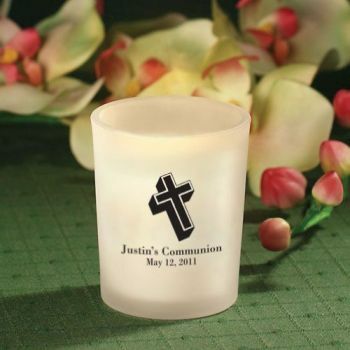 Your child's First Communion is a momentous milestone in his or her life so mark this special occasion with our personalized Communion candle favors. Beautifully designed, these unique favors have a white frosted glass votive holder with poured white tealight candle within measuring 2.5" tall and 2.125" in diameter. Choose from our themes and graphics or make your own design for the front of each candle. A wonderful keepsake, your guests will treasure their personalized Communion candle favors for years to come. This item no longer comes with a poured white votive candle, instead it comes with a white tealight candle. I was so pleased with the quality of the personalization and the imprint of the cross. Absolutely happy with the ordering & delivery of the candle.